I sat on the floor of the playroom our church had so mercifully created just upstairs from the coffee shop. As I built a foam castle with one child and made goofy faces at the baby, the mother of these sweet kiddos poured out her heart to me. And as we talked I was struck by the fact that if someone were to peek through the window and take in the scene before them, it wouldn’t look anything like the image of community that is so often portrayed in our Instagram feeds. You guys, there wasn’t an old barn in sight. 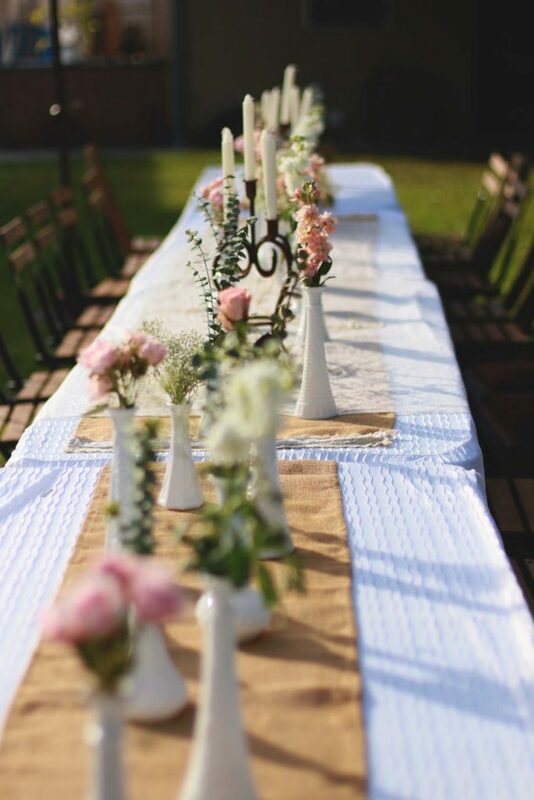 No long trestle table covered in mason jars overflowing with wildflowers, the soft glow of candlelight and impeccable place settings made to look effortless and casual…with a barn in the background. We weren’t standing in a field, heads thrown back in laughter over a joke only we were privy to. Instead, I juggled my coffee while board books were being piled up on my lap by the toddler and this precious mama attempted to keep the baby occupied with puff cereal so that she could maybe, just maybe, string enough sentences together to convey to me what was on her heart. It was messy and hard. We were interrupted…a LOT. And yet there were beautiful things happening in that room. I’m going to admit something to you…I’ve scrolled through my social media and seen those women standing against the side of a barn, clustered together in obvious kinship and felt the envy welling up inside of me. Why has no one ever asked me to wear a crown of flowers on my head and hold hands in a beautiful display of sisterhood? Why have I never been invited to sit down at that trestle table with the chandeliers hanging from the trees above and the charcuterie boards covered in cheese and other delectable treats. I really like cheese. And even if I could find a barn to stand in front of or a trestle table in a field, would I be welcomed in my yoga pants and ponytail? 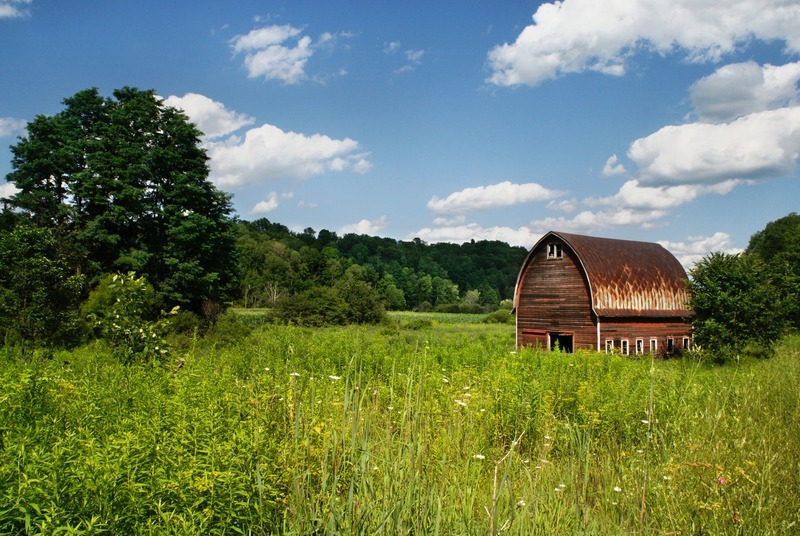 If I were to be invited to that barn (and probably after hitting the publish button on this someone is going to email me about coming to a barn because God just has that kind of sense of humor), I would honestly think it was so much fun. I can frolic through a field with the best of them! I would be honored to stand with my tribe and celebrate the beauty of doing life together. So, please, please, please, hear my heart that I am not condemning these activities. I’m not saying that there isn’t significance and value in them. Because there is! I just think that somewhere along the line, we’ve begun to hold up those images as an ideal, as the standard. But, the reality is that those are actually a one-off. Those are special moments in time. Like a holiday, a birthday, a weekend getaway or that time I spent less than $50 at Target. They’re not the norm. They’re not the everyday. For me, the everydayness of community has looked less like an Anthroplogie ad and more like sitting on a couch crying with a friend as she shares about the hard season she is in. Or sitting in my car outside the school talking through a rolled down window to the mom sitting in her car next to me, commiserating over the painful years that are middle school. It’s looked like taking a crying baby out of the arms of their weary mama at church and walking that little one around and around the lobby so that maybe mom can just sit and enjoy the sermon or even get a little shut-eye since everyone will just think she is deep in prayer. The everydayness of community for me has looked like getting ready to board an airplane and realizing I had forgotten an important deadline and frantically texting friends begging to be covered in prayer and watching as the words of encouragement come flooding in. 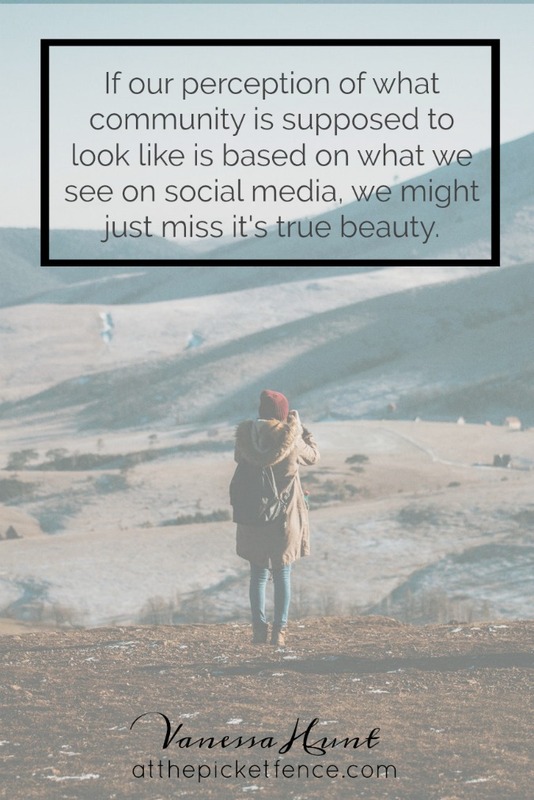 I think that if our perception of what community is supposed to look like is based on what we see on social media, we might just miss it’s true beauty. And, in addition, if our perception of what community is supposed to look like is based on what we see on social media, we might be afraid to even make attempts to build it. One of my favorite references to community in scripture is found in Hebrews 10:24-25. There is so much beauty to be found in gathering together, motivating each other, holding one another accountable, investing in someone’s life and having them invest in yours. There is beauty in trying to talk to a friend while pushing your kids on the swings or ugly crying together when life just doesn’t turn out the way you thought it would. There is beauty in pizza boxes stacked on the counter because you wanted to have people over for dinner but didn’t have the time (or the desire!) to plan a fancy meal. Community can look like so many different things and can happen in so many different places. And one of my greatest fears is that a woman will look at a beautifully staged (but made to look un-staged) photo and think that since nothing in her life even remotely resembles that image, that there isn’t a place for her. Because there is. There is a place for every.last.one.of.us to be apart of a community. And it can happen anywhere. On the floor of a playroom or in the pickup line at school, in a coffee shop or in a church. It can even happen in a beautiful old barn or around an elegantly decorated trestle table. It’s not really about the place, after all. It’s about the heart. And the intention. And MY intention is that you will always feel apart of a community here. That this would be a place where you are free to just ‘be’. Where I can share my heart and you can share yours and we can do this thing called life together. Do you feel like you are apart of a community? What does community mean/look like to you? How does social media impact your perceptions of how others are doing community? How can I be praying for you in this area? 22 Comments on "Community Doesn’t Just Happen in Front of a Barn"
Or run through a field together!! LOL! I loved this post. I am blessed to be part of several communities and try never to take that for granted. What I did take away from this post was to challenge myself to invite others into those communities or to start/join additional ones when I meet new people. It is so easy to stay in my comfort zone with my peeps but then I will miss an opportunity to support or be supported. Thank you, Vanessa, for being real and offering that safe place! It is so hard “to just be” – social media is hard – even if, in your heart, you know it is not always real life. That was beautifully written. You are right, life just happens where ever we are. I’m a cashier at the grocery store and sometimes my customers say they feel like I’m their therapist. We have only a few moments together between important questions like, “paper or plastic?” When you meet someone you click with you give them your best thoughts. Hopefully you have planted a seed. When they are ready it will grow. Lovely. I am a part of different communities…my church community supports me in faith, belief and family feelings. My writing community offers support in inspiration, creativity, and friendship. My blogging community gives ideas, wisdom, and encouragement. It is all important t round me out! Rose that is such an incredible thing to be apart of different communities that each bring value to your life. Such a gift! Such a beautiful post, Vanessa. As an introvert, I find my community happens much like you describe (opposite of IG posts) and I’m learning that’s okay. Thank you for validating it once again. Blessings! You are so right Cathy!! Thank you for coming by today and for your kind words. Blessings to you! Mary I am SO glad you feel welcomed here because we love having you part of our community! Happy Spring to you too! Community happens in what my dear, little mother used to call ‘Divine appointments’ – in the grocery store, on the phone, beside the mailbox. Wherever God brings people into your life. I think we can just imagine those places are beside the barn. Community – those God moments – are a social media thing. They are all about how open we are for God to use us. Thank you for these beautiful words. So needed today. I love your heart. The Lord shines through you, Thank you! My husband and I moved 3 hours away from where I had spent most of my life about 20 months ago. I’ve been trying to feel comfortable and I now realize what I’m missing. Thanks to your post – Community is my answer! Thank you, thank you, thank you!